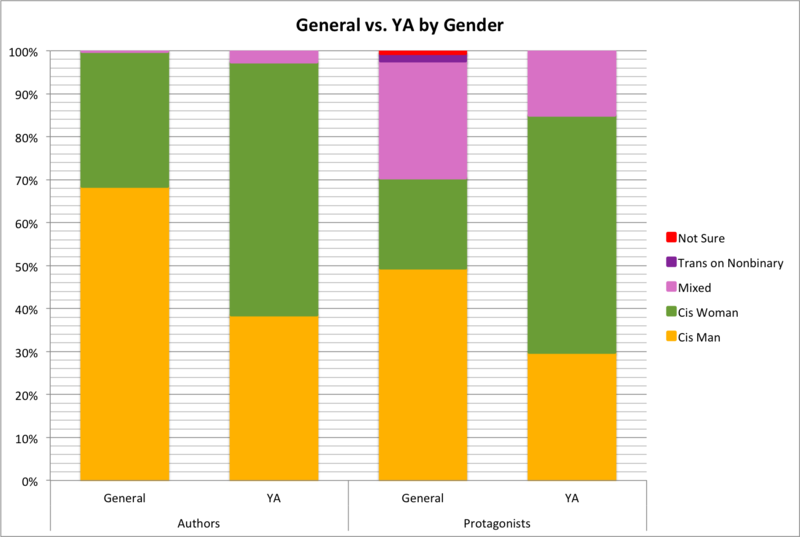 Today over at Lady Business: a data-heavy look at the gender of award-winning f/sf writers and their protagonists. It’s an important post, stuffed with numbers and charts on 19 different fantasy and science-fiction awards. Their data—and there’s a huge amount—support the conclusion I’ve reached before: books about women tend not to win prestigious literary awards. 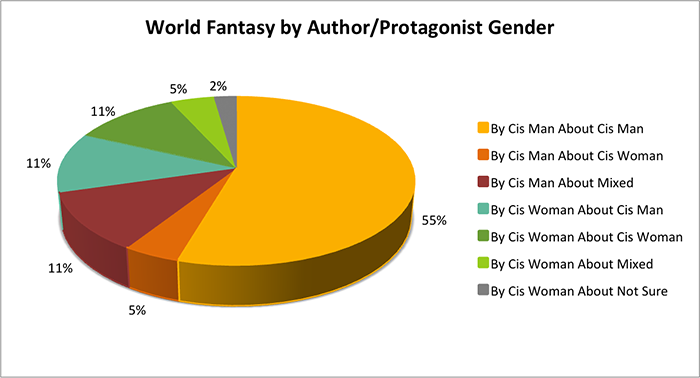 This project demonstrates that SFF books by or about cis women are less likely to win awards than books by or about cis men. Trans and nonbinary authors do not win awards at all, and trans or nonbinary protagonists are extremely rare. Overall, there were more award-winning books written by cis men about cis men than there were books by women about anybody. While there have been recent gains in terms of diversity in awarded books, this is likely part of a cycle of gains and pushback that has repeated itself throughout the history of SFF awards. SFF awards have a problem when it comes to gender: they privilege cis men and the cis male experience over that of cis women and trans and nonbinary individuals. Lady Business has kindly given me permission to use some of their data plus a handful of charts. The analysis below is mine—I’ve not yet evaluated their whole post; we may differ on a few minor points—but the data and charts are mostly theirs, so please make sure they get due credit. Lady Business counted a total of 751 individual f/sf prizes awarded for book-length fiction aimed at both Adult and Young Adult readers1. 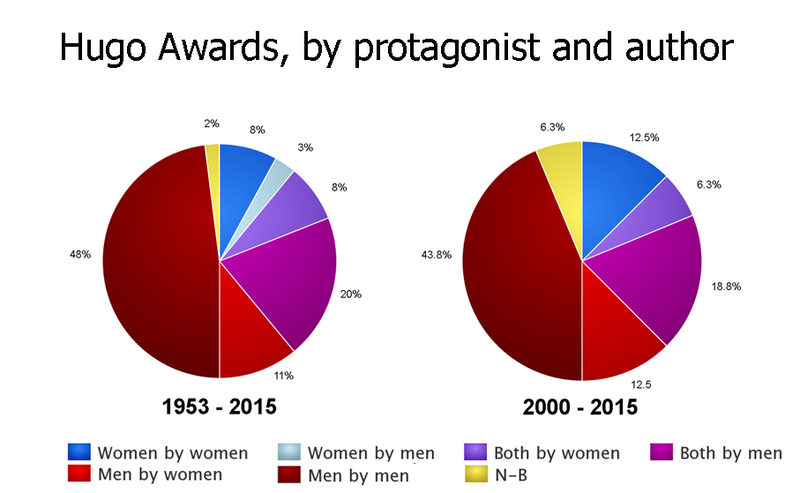 The older, more established awards show predictably lopsided results: overwhelming bias against women both as writers and protagonists. World Fantasy Award-winning women wrote about men as often as they wrote about women—while men wrote about men 11 times as often as about women. Lady Business’s comparison of Adult and Young Adult awards is particularly interesting. As I found out in my original post, stories about girls are fine and worthy as award-winners, but once girls grow up to be women, we no longer count; we seem to become unimportant and/or uninteresting, unworthy of prizes. On first glance, it looks as though things are getting better. Almost hopeful. 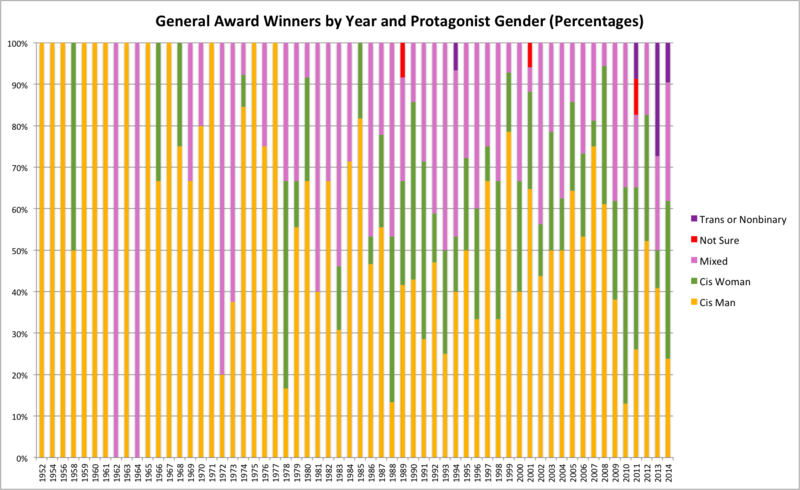 But before I feel sure of that I’d like to split out the data to compare each award to itself over time: the Hugos over time, the World Fantasy over time, the Ditmars over time. That way I’d be confident that individual awards were changing, rather than the change being due to the admixture of data, the addition of more popular/less-restricted awards in recent times, and the loosening of some restrictions on other awards, such as the Locus. I haven’t yet had time, though, to see if the data on the Lady Business spreadsheets would support that kind of slicing and dicing. My own Hugo data, which covers the last 15 years, might be make a useful comparison to Ladybusiness’s 63 years-worth of same. Judging by the comparison, the improvement over time is marginal: in the last 15 years, women writing about women have won 13.3% of the awards whereas over the last 63 years they won 8%: an overall increase of only 5%.7 Five percent. In half a century. That’s not much. Change might be coming, but it’s coming slowly. How do we accelerate this change? To paraphrase Maya Angelou: to do better, we have to know better.8 And that won’t happen overnight. We have to gather data to find the inflection points of the operation of bias. It’s only once those are clear that we can sensibly experiment by applying pressure at specific points and seeing what happens. Meanwhile? Take the Russ Pledge. And go read the post at Lady Business; tell them how much you appreciate their work. Spread the word. 1 For some of these awards, such as the Hugo, there are several decades of data from a single category; other, such as the Goodreads, have only been in existence a handful of years but are followed in several categories. 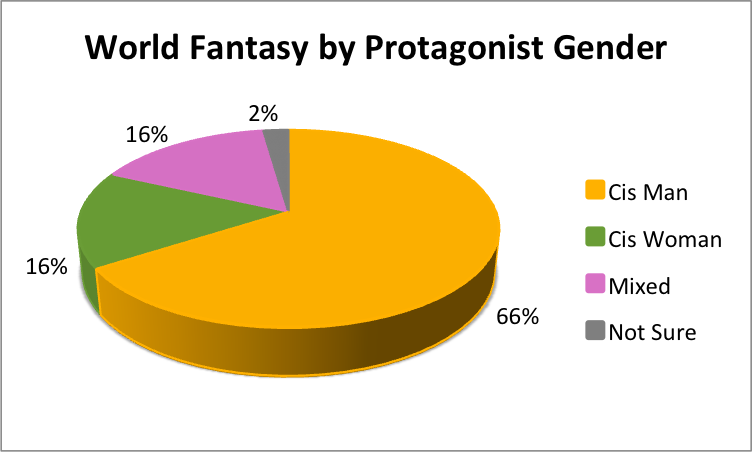 2 Fantasy has often been considered to be more open to women than sf. These results fly in the face of that supposition. 3 The jury votes on a shortlist selected (mostly) by another restricted group: those who can afford membership in the annual World Fantasy Convention. The jury itself is selected by the World Fantasy Awards Administration. They Who selects WFAA? Good question. But there’s an interesting look at the age of WFA winners on Tor.com which might offer some clues. 4 Admittedly, we’re not comparing apples to apples here. 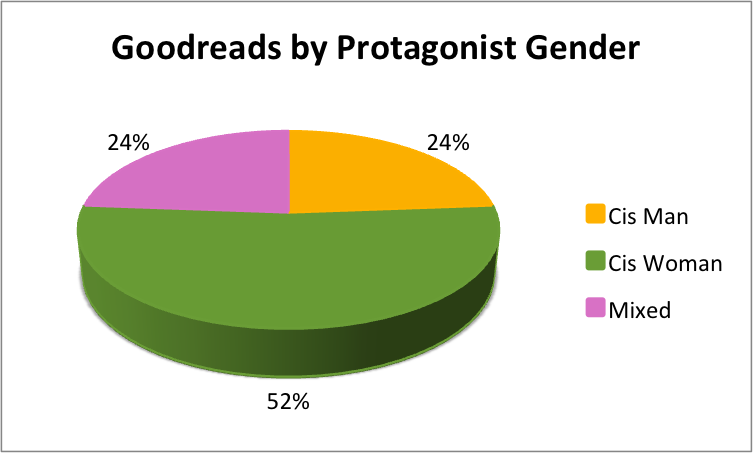 I think Ladybusiness combined several categories for the Goodreads data, while WFA looks only at one. 5 I’m getting more and more curious about the gender mix of those who vote on these things. Prizes such as the Man Booker, for example, are relatively well-balanced when it comes to the jury—though I don’t know about the composition of those who select those juries, or those who chair them, which (if I had to guess, which I do, because I don’t have data) skew heavily male. 6 I am heartened by the appearance and increase of non-binary and/or trans protagonists. I’m not sure Ladybusiness and I count and categorise the same way, though. My approach so far has been that if an author or protagonist identifies as a woman or man I’ll count them as such. So far it hasn’t come up in the awards I’ve looked at but I’m eager for input on this. 7 And men writing entirely about men still win the lion’s share: 43.8% in the last 16 years vs. 48% over the last 63. The decrease in stories about men more or less matches the increase in stories about women: a little less and a little more than 5% respectively. Interestingly, fewer men (that is, none in the last 16 years as opposed to 6.3% over the award’s history) win for writing wholly about women. What does this mean? I don’t know. I’d love to hear your ideas. It would also be interesting to see if there are fewer women overall being pegged as award-worthy (i.e. if 10 women share 80% of the nominations vs a larger group of men sharing nominations — that is, the idea that there are MORE award worthy male authors and only a few Smurfette female authors). I don’t know if this is true, but combined with how books are reviewed and viewed critically it might show up some interesting patterns. *Yes, some books are just “fun” but in other cases there may be biases at work.